The original thirteen colonies of the United States were settled along the east coast of North America. For many years, few colonists went beyond the Appalachian Mountains. However, as the country gained independence and continued to grow, more land was needed. The country began to expand into the western frontier. In 1700 there were around 250,000 colonists living in the American colonies. By 1775, this number had grown to 2.5 million. Many people wanted new land to farm and hunt. They began to move west of the Appalachians. One of the first areas settled was the Northwest Territory. This area today makes up the states of Indiana, Ohio, Michigan, Wisconsin, and Illinois. Daniel Boone led settlers across the Cumberland Gap and into Kentucky. In 1803, President Thomas Jefferson bought the Louisiana Territory from the French for $15 million. This was a huge area of land west of the Mississippi River. It nearly doubled the land size of the United States. President Jefferson sent explorers Lewis and Clark to learn more about this vast frontier. Many people in the United States believed it was the country's destiny to expand westward all the way to the Pacific Ocean. This belief became known as the Manifest Destiny. 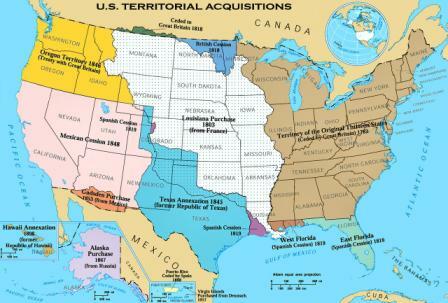 The United States continued to expand westward and gain land. After a war with Mexico over the rights to Texas, the country gained much of the southwest including the land of California. They also gained the Oregon Territory in a treaty from Great Britain. Pioneers and settlers moved out west for different reasons. Some of them wanted to claim free land for ranching and farming from the government through the Homestead Act. Others came to California during the gold rush to strike it rich. Even others, such as the Mormons, moved west to avoid persecution. As the first settlers and pioneers moved into the west, there was little government. The law was the local sheriff and people had to look to protect themselves against bandits and outlaws. During this time, gunslingers of the west such as Wild Bill Hickok and Jesse James became famous. In 1890, the US government announced that the west had been explored. The country now had 44 states. Only Utah, New Mexico, Oklahoma, and Arizona had not been admitted as states from today's contiguous 48 states. The population of the United States grew from 5.2 million people in 1800 to 76.2 million in 1900. President James K. Polk played a major role in expanding west. During his presidency much of the land west of the Louisiana Purchase was added to the county including Texas, the Mexican Cession, and the Oregon Territory. The Transcontinental Railroad and Transcontinental Telegraph were both important in keeping the large country together in the early days. Westward Expansion had a large impact on the Civil War. The South wanted western states to be slave states while the North wanted slavery to be illegal in the new states. Westward Expansion by Dale Anderson. 2001. Which Way to the Wild West? : Everything Your Schoolbooks Didn't Tell You About America's Westward Expansion. 2009. Wagon Trains and Settlers by Ellen H. Todras. 2011. Wild West days: Discover the Past with Fun Projects, Games, Activities, and Recipes. 1998. Why the West was Wild by Wayne Swanson. 2004.